THE VICE PRESIDENT: Ron, Mr. Ambassador, my name is Joe Biden, and everybody knows I love Israel. As a matter of fact, my daughter — I — the dream of every Irish-Catholic father is for his daughter to marry a Jewish surgeon. (Laughter.) And she did. But I want you to know I think the only time on record, at least in the state of Delaware, in the oldest Catholic church in the state, the second oldest — 1842 — we signed the ketubah in the Catholic rectory. (Laughter.) Not a joke. (Laughter.) Not a joke. I think that’s a first. We had a chuppah on the altar, handmade, magnificently, beautiful chuppah. And we had a Catholic priest, Father Murphy, and a rabbi, and it was hard getting a rabbi, by the way. (Laughter.) I had to go up to Montgomery County to find one. (Laughter.) And the reason why — Montgomery County, Pennsylvania — and the reason he came is his mother loved me. (Laughter.) But — and my daughter asked me, she said, Daddy, what do you want played at the wedding? I said, just one — maybe the concluding hymn could be “On Eagles’ Wings”. What you did next was no less than miraculous. You were blessed with one of the greatest generations of founding fathers and mothers of any nation in the history of the world — Ben-Gurion, Meir, Begin, Sharon, Rabin, Peres. They all fashioned Israel into a vibrant, vibrant democracy. And in the process, you built one of the most innovative societies on Earth. In the process, you defended your homeland and became the most powerful military in the entire region. And all these years later, things have changed, but the danger still exists. But the people of Israel still live in a dangerous neighborhood. And just to be an Israeli — it still demands uncommon courage. So today, we celebrate your independence and our friendship, which was born just 11 minutes after Israel’s founding. And President Obama and I are proud to carry forward the unbroken line of American leaders –- Democrat and Republican —- who have honored America’s sacred promise to protect the homeland of the Jewish people. Just look at the facts. Each time a rocket has rained down from Gaza, President Obama stands up before the world and defends Israel’s right to defend itself like any other nation. Under President Obama, with the United States Congress, America has provided $20 billion in military assistance to Israel -– and cutting edge weaponry needed to maintain the qualitative advantage against any potential opponent. Our commitment to protect Israel’s security in my case and many of your case is not just political or national interest, it’s personal. It’s personal for me and it’s personal for the President. You’ve heard me say this many of my friends out there before, but it bears repeating on this day, it began at my father’s dinner table. My father was a righteous Christian. We assembled to eat, to have discussions — and occasionally eat. My father talked about how he could not understand why there was a debate among Americans or why there was a debate among American Jews about whether or not we should have recognized Israel; why there would be any debate about why we hadn’t done more; why we hadn’t — that’s where I first learned about not bombing the railroad tracks. I learned from my father about the concentration camps. And the first thing I did with my children when each of them turned 15, I took them to Europe, flew them directly to Dachau, and made them spend a day there with me. And I’ve done the same with my grandchildren. My grandchild Finnegan as recently as just a month ago where we met with a 94-year-old survivor of Auschwitz, as well as Dachau. He showed us the camp because he was proud — proud — to welcome the Vice President and his granddaughter. All you have to do to understand is stand on the Golan and look down. I remember the first time I did that as a young senator. All you have to do is wander throughout Israel. All you have to do is take that helicopter ride the entire length of the fence. All you have to do is just look at the map. All you had to is set foot at Yad Vashem -— and you understand. I’ve had the great privilege of knowing every Israeli Prime Minister since Golda Meir and more than just casually. And I’ve worked with many of you in this room for up to 40 years. You know me. You raised me. You educated me. And I know you. So believe me when I tell you: It’s not only personal to me, it’s personal to President Obama, as well. The President was raised with memories of his great-uncle, who marched with Patton’s Army to liberate Jewish prisoners from the horrors of Buchenwald. As a young man, he grew up learning about Israel from the stories of Leon Uris’ in “Exodus”; the Six-Day War; and Moshe Dayan, with his eye patch and his courage. I remember sitting in front of Golda Meir’s desk as she flipped those maps up and down, chain-smoking, talking about the losses of the Six-Day War, sitting next to her military attaché at the time, a guy named Rabin. But Barack, as a young senator — being 19 years younger than I am, he heard about it. He read about it. As senator, Barack Obama went to a small town in southern Israel to see with his own eyes the lives of the families who live under threat of rockets -– families that he has helped protect as Commander-in-Chief, under Iron Dome. As President, he stood in Jerusalem, and declared to the whole world, “Those who adhere to the ideology of rejecting Israel’s right to exist, they might as well reject the earth beneath them or the sky above, because Israel is not going anywhere. So long as the United States of America is there, Israel will never be alone.” (Applause.) He means it. He means it. You know I mean it. I’m telling you he means it. That’s my President. He understands the need for Israel to have the right and the capacity and the capability to defend itself. At the same time, he says, “we have Israel’s back” — and you can count on it. The same commitment to the survival and security of Israel is fundamental to our strategy for the entire Middle East. And then we get into the controversial piece. Iran. Remember this is the President who made it for the first time in American history a declared policy of the United States to use all the instruments of our power to prevent -— not contain, prevent –- Iran from ever acquiring a nuclear weapon. He stated that all options are on the table -— then he made sure of what did not exist before. He made sure we spent the time and money and the research to develop the capacity required to act against their capacity to develop a weapon if ever needed. Over the skepticism of many, we worked with the U.S. Congress, our European allies, and Russia, China, to put in place the toughest sanctions regime in modern history. We also knew the cost of not negotiating. Midway through the last administration, the U.S. government refused to directly engage. It insisted at the same time that Iran dismantle its entire program. The result? By the time President Bush left office, Iran had dramatically advanced its movement toward ability to acquire a nuclear weapon. So we’ve taken a different approach, combining unprecedented pressure with direct diplomacy to find an enduring solution. Negotiations began. And we’ve come a long way. And you’ve all seen the parameters that were put forward. It’s a framework, only a framework — not a final deal. A great deal of work lies ahead to see if Iran will actually enshrine the commitments that went into that framework as part of a final deal. If they do, each of Iran’s paths to a bomb would be meaningfully and verifiably blocked. Iran would cut its enrichment capacity by two-thirds; shrink its stockpile of low-enriched uranium by 98 percent. Breakout time to create a weapon’s worth of bomb-grade material will go from two to three months, which it is today, to over a year. The deal would ensure at least a one-year breakout cushion for a decade. And for years after that, the breakout time would continue to be longer than it exists today. We’ll prevent the Arak reactor from ever being a source of plutonium for nuclear weapons. We will put in place the toughest transparency and verification requirements in history -— providing the best possible check against a secret path to the bomb. This isn’t a grand bargain between the United States and Iran. It’s a nuclear bargain between Britain, France, Russia, China, Germany, the EU, America and Iran. It’s based on hard-hitting, hard-headed, uncompromising assessments of what is required to protect ourselves, Israel, the region, and the world. And if the final deal on the table that doesn’t meet the President’s requirements, we simply will not sign it. A final deal must effectively cut off Iran’s pathways to the bomb. If it doesn’t, no deal. A final deal must ensure a breakout timeline at least for one year for a decade. If it doesn’t, no deal. A final deal must include phased sanctions relief, calibrated against Iran taking meaningful steps to constrain their program. If it doesn’t, no deal. A final deal must provide a verifiable assurance to the international community demands to ensure Iran’s program is exclusively peaceful going forward. If it doesn’t, no deal. And if Iran cheats at any time and goes for a nuclear weapon –- every option we have to respond today remains on the table. And your military will tell you, and more. I’ve been involved in arms control negotiations since I was a kid in the Senate at 30 years of age — every major SALT agreement, START agreement, and toward the end, I was deeply involved negotiating when Brezhnev was still around, leading a delegation of senators. But just like arms control talks with the Soviet Union —- another regime we fundamentally disagreed with, another regime whose rhetoric was outrageous and unacceptable, another regime whose proxies were forcefully making trouble, and we forcefully countered around the world –- we negotiated to reduce the nuclear threat to prevent a nuclear war. And it kept us safer. That’s what we’re attempting to do today. We also continue to agree with Israeli leaders going back decades –- from Rabin to Sharon, whose funeral I had the great honor of eulogizing –- that a two-state solution is essential to Israel’s long-term survival as a democratic homeland for the Jewish people. Consistent with our commitment to Israel’s security and survival, the United States stands ready to help Israel decide — if they decide — how to get there and if they want our help in getting there. That’s why we must never retreat from fighting every scourge and source of anti-Semitism as we find it. You see, in too many places where legitimate criticism crosses over into bigotry and anti-Semitism; where an explicitly anti-Semitic attack takes place at a kosher grocery store; assaults on religious Jews in the streets of major European capitals. Some of you may remember how harshly I was criticized as Chairman of the Foreign Relations Committee over 15 years ago when I held hearings on anti-Semitism in Europe. Emerson said, society is like a wave, the wave moves on, but the particles remain the same. Wherever, in whatever country, whatever circumstance it rears its head, we have to stop it. Enough is enough. We have to fight it everywhere we find it. I’ll conclude — and my friends kid me and I imagine Ron may, as well — telling you the story about my meeting with Golda Meir. The reason I do it had a profound impact on me, one of the most consequential meetings I’ve ever had in my life. I think I’ve met every major world leader in the last 36 or 37 years in the world, in a literal sense. But I remember meeting for close to an hour with her. She went through what happened in the Six-Day War, and the price that was paid. And I just had come from Egypt. They let me go to Egypt and go to the Suez Canal. And I was saying to she and Rabin that I thought that they were getting ready to attack again. And everyone including my military and Israeli military thought I was crazy. I remember driving from Cairo all the way to out to the Suez. And you could see these great plumes of dust and sand. But none it seemed isolated. It turns out it was maneuvers taking place in the desert. And I was really worried. And we went through, and she painted a bleak, bleak picture — scared the hell out of me, quite frankly, about the odds. And all of a sudden she looked at and she said, would you like a photograph? And I said, yes, ma’am. And those double-blind doors opened up into that hallway — not hallway. It looks like — it’s a foyer. And we walked out, and the press was standing there. We didn’t say anything. We just stood side by side. And she must have thought I looked worried. And it’s an absolutely true story. She didn’t look at me, she spoke to me. She said, Senator, you look so worried. I said, well, my God, Madam Prime Minister, and I turned to look at her. I said, the picture you paint. She said, oh, don’t worry. We have — I thought she only said this to me. She said, we have a secret weapon in our conflict with the Arabs. You see, we have no place else to do. The truth of the matter is we need you. The world needs you. Imagine what it would say about humanity and the future of the 21st century if Israel were not sustained, vibrant and free. We’ll never stop working to ensure that Jews from around the world always have somewhere to go. We’ll never stop working to make sure Israel has a qualitative edge. And whomever the next President is — Republican or Democrat — it will be the same because the American people, the American people are committed. The America people understand. U.S. Vice President Joe Biden addresses convention held by pro-Israel lobby group; says President Obama is not bluffing on stopping Iran from obtaining a nuclear weapon. THE VICE PRESIDENT: Thank you, Mr. President. (Applause.) It’s great to be here. It’s great to be here. (Applause.) Hey, Debbie. Ladies and gentlemen, oh, what a difference 40 years makes. (Laughter.) I look out there and see an old friend, Annette Lantos. Annette, how are you? Her husband, Tom Lantos, a survivor, was my assistant, was my foreign policy advisor for years. 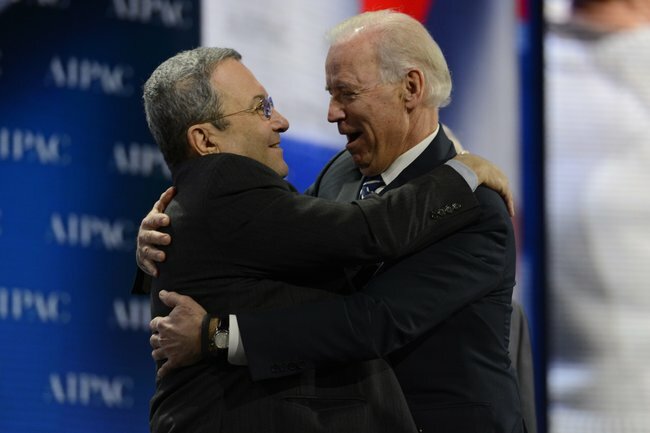 And Tom used to say all the time, Joe — he talked with that Hungarian accent — he’d say, Joe, we must do another fundraiser for AIPAC. (Laughter.) I did more fundraisers for AIPAC in the ‘70s and early ‘80s than — just about as many as anybody. Thank God you weren’t putting on shows like this, we would have never made it. (Laughter.) We would have never made it. There is a standup guy. There is a standup guy. Standing up for his country, putting his life on the line for his country, and continuing to defend the values that we all share. (Applause.) I’m a fan of the man. (Applause.) Thanks for being here, Ehud. It’s good to be with you again. Ladies and gentlemen, we’ve stood shoulder to shoulder, a lot of us in this auditorium, defending the legitimate interest of Israel and our enduring commitment over the last 40 years. And many of you in this hall — I won’t start to name them, but many of you in this hall, starting with Annette Lantos’s husband, who is not here, God rest his soul — many of you in this hall have been my teachers, my mentors and my educators, and that is not hyperbole. You literally have been. It was at that table that I learned that the only way to ensure that it could never happen again was the establishment and the existence of a secure, Jewish state of Israel. (Applause.) I remember my father, a Christian, being baffled at the debate taking place at the end of World War II talking about it. I don’t remember it at that time, but about how there could be a debate about whether or not — within the community, of whether or not to establish the State of Israel. My father would say, were he a Jew, he would never, never entrust the security of his people to any individual nation, no matter how good and how noble it was, like the United States. (Applause.) Everybody knows it’s real. But I want you to know one thing, which some of you — I’ve met with a lot of you over the last 40 years, but the last four years as well. President Obama shares my commitment. We both know that Israel faces new threats, new pressures and uncertainty. The Defense Minister and I have discussed it often. In the area of national security, the threats to Israel’s existence continue, but they have changed as the world and the region have changed over the last decade. The Arab Spring, at once full of both hope and uncertainty, has required Israel — and the United States — to reassess old and settled relationships. Iran’s dangerous nuclear weapons program, and its continued support of terrorist organizations, like Hezbollah and Hamas, not only endanger Israel, but endanger the world. (Applause.) Attempts of much of the world to isolate and delegitimize the State of Israel are increasingly common, and taken as the norm in other parts of the world. President Obama last year requested $3.1 billion in military assistance for Israel — the most in history. He has directed close coordination, strategically and operationally, between our government and our Israeli partners, including our political, military and intelligence leadership. Not long ago, I would have had to describe to an audience what Iron Dome was, how it would work, why funding it mattered. I don’t have to explain to anybody anymore. Everybody gets it. (Applause.) Everybody saw — the world saw firsthand why it was and remains so critical. For too long, when those sirens blared in the streets of the cities bordering Gaza, the only defense had been a bomb shelter. But late last year, Iron Dome made a difference. When Hamas rockets rained on Israel, Iron Dome shot them out of the sky, intercepting nearly 400 rockets in November alone. It was our unique partnership — Israel and the United States — that pioneered this technology and funded it. And, ladies and gentlemen, it matters. It matters. To put it bluntly, there is only one nation — only one nation in the world that has unequivocally, without hesitation and consistently confronted the efforts to delegitimize Israel. At every point in our administration, at every juncture, we’ve stood up on the legitimacy — on behalf of legitimacy of the State of Israel. President Obama has been a bulwark against those insidious efforts at every step of the way. As recently as last year, the only country on the United Nations Human Rights Council to vote against — I think it’s 36 countries, don’t hold me to the exact number — but the only country on the Human Rights Council of the United Nations to vote against the establishment of a fact-finding mission on settlements was the United States of America. Ladies and gentlemen, that’s why we refuse to attend events such as the 10th anniversary of the 2001 World Conference on Racism that shamefully equated Zionism with racism. (Applause.) That’s why we rejected anti-Semitic rhetoric from any corner and from leaders of any nation. And that’s why I’m proud to say my friend, the new Secretary of State, John Kerry, spoke out against the kind of language in Ankara just this Friday. (Applause.) By the way, he’s a good man. You’re going to be happy with Kerry. So we remain deeply engaged. As President Obama has said, while there are those who question whether this goal may ever be reached, we make no apologies for continuing to pursue that goal, to pursue a better future. And he’ll make that clear when he goes to Israel later this month. Iraq’s [sic] acquisition of a nuclear weapon not only would present an existential threat to Israel, it would present a threat to our allies and our partners — and to the United States. And it would trigger an arms race — a nuclear arms race in the region, and make the world a whole lot less stable. the need to act occurs, it is critically important for the whole world to know we did everything in our power, we did everything that reasonably could have been expected to avoid any confrontation. And that matters. Because God forbid, if we have to act, it’s important that the rest of the world is with us. (Applause.) We have a united international community. We have a united international community behind these unprecedented sanctions. We have left Iran more isolated than ever. When we came to office, as you remember — not because of the last administration, just a reality — Iran was on the ascendency in the region. It is no longer on the ascendency. The purpose of this pressure is not to punish. It is to convince Iran to make good on its international obligations. Put simply, we are sharpening a choice that the Iranian leadership has to make. They can meet their obligations and give the international community ironclad confidence in the peaceful nature of their program, or they can continue down the path they’re on to further isolate and mounting pressure of the world. This isn’t just about a threat to Israel and the United States. It’s about a global terrorist organization that has targeted people on several continents. We’ll say and we’ll do our part to stop them. And we ask the world to do the same. That’s why we’ve been talking to our friends in Europe to forcefully declare Hezbollah a terrorist organization. This past month I’ve made the case to leading European heads of state, as Barack and Israelis know, together we have to continue to confront Hezbollah wherever it shows — sews the seeds of hatred and stands against the nations that sponsor campaigns of terror. We have no illusions — we know how difficult this will be and how difficult it is. There’s been — obviously been a dramatic change in Egypt. A lot of it has given us hope and a lot of it has given us pause, and a lot of it has caused fears in other quarters. Only through engagement — it’s only through engagement with Egypt that we can focus Egypt’s leaders on the need to repair international obligations — respect their international obligations, including and especially its peace treaty with Israel. It’s only through active engagement that we can help ensure that Hamas does not re-arm through the Sinai and put the people of Israel at risk. It’s only through engagement that we can concentrate Egypt’s government on the imperative of confronting the extremists. And it’s only through engagement that we can encourage Egypt’s leaders to make reforms that will spark economic growth and stabilize the democratic process. And it’s all tough, and there’s no certainty. There’s no certainty about anything in the Arab Spring. I expect President Obama to cover each of these issues in much greater detail. I’ve learned one thing, as I was telling the President, I learned it’s never a good idea, Ehud, to steal the President’s thunder. It’s never a good idea to say what he’s going to say the next day. So I’m not going to go into any further detail on this. (Laughter.) But in much greater detail he will discuss this when he goes to Israel later this month, just before Passover begins. These are really important conversations for the President to have and to hear and for them to hear. These are critically important. I get kidded, again to quote Debbie, she kids sometimes, everybody quotes — Democrat and Republican — quotes Tip O’Neill saying, all politics is local. With all due respect, Lonny, I think that’s not right. I think all politics is personal. And I mean it: All politics is personal. And it’s building personal relationships and trust and exposure, talking to people that really matters, particularly in foreign policy. So, ladies and gentlemen, let me end where I began, by reaffirming our commitment to the State of Israel. It’s not only a longstanding, moral commitment, it’s a strategic commitment. An independent Israel, secure in its own borders, recognized by the world is in the practical, strategic interests of the United States of America. I used to say when I — Lonny was president — I used to say if there weren’t an Israel, we’d have to invent one. Now, I’m sure every kid up there said, you can’t be that old, Senator. (Laughter.) I hope that’s what you’re saying. (Laughter.) But seriously, the first trip I ever made — and you all know those double doors. You just go into the office and the blonde furniture and the desk on the left side, if memory serves me correctly. And Golda Meir, as a prime minister and as a defense minister, she had those maps behind her. You could pull down all those maps like you had in geography class in high school. And she sat behind her desk. And I sat in a chair in front of her desk, and a young man was sitting to my right who was her assistant. His name was Yitzhak Rabin. (Laughter.) Seriously — an absolutely true story. (Applause.) And she sat there chain-smoking and reading letters to me, letters from the front from the Six-Day War. She read letters and told me how this young man or woman had died and this is their family. This went on for I don’t know how long, and I guess she could tell I was visibly moved by this, and I was getting depressed about it — oh, my God. And she suddenly looked at me and said — and I give you my word as a Biden that she looked at me and said — she said, Senator, would you like a photo opportunity? (Laughter.) And I looked at her. I said, well yes, Madam Prime Minister. I mean I was — and we walk out those doors. We stood there — no statements, and we’re standing next to one another looking at this array of media, television and photojournalists, take — snapping pictures. And we’re looking straight ahead. 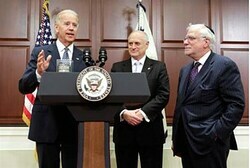 U.S. Vice President Joe Biden told American Jewish leaders Tuesday “all options are on the table” to prevent a nuclear-armed Iran. Speaking with 70 leaders of the Conference of Presidents of Major American Jewish Organizations in Washington, Biden and other senior Obama administration officials briefed the leaders on U.S. foreign policy. The emphasis was on Iran, which secured an apparent agreement with the United Nations nuclear watchdog agency that Israel sees as not being strong enough to deter Iran from its nuclear ambitions. The deal is supposed to allow United Nations nuclear inspectors to visit Iran’s nuclear sites. Iranian officials are to meet in Baghdad on Wednesday with the “P5 + 1,” comprised of the five United Nations Security Council permanent members and Germany. Iran is to receive a proposal that is expected to include its agreement to shut down a high-grade uranium enrichment operation. Israeli leaders are strongly skeptical of any agreement that does not require Iran to stop all enrichment of uranium, a key element for a nuclear weapon. At the meeting with Jewish leaders, the American officials, including Deputy National Security Advisor Dennis McDonough reiterated the administration’s “ironclad” commitment to Israel’s security. The Conference leaders routinely meet with White House officials once a year, but Tuesday’s meeting was politically important because of the presidential elections in November. Virtually all polls show that President Barack Obama and Republican Mitt Romney, who has sewn up the GOP nomination, are running neck and-neck, with a marginal advantage to Romney. Vice President Biden met today at the White House with representatives of the Conference of Presidents of Major American Jewish Organizations. The Vice President addressed the Obama Administration’s unprecedented support for Israel’s security; our steadfast opposition to any attempts to delegitimize Israel; and our commitment to a lasting, secure peace that is in the interest of Israelis, Palestinians and the United States. The Vice President also discussed a range of regional issues, including Iran. The Vice President praised attendees for their support of a strong relationship between the United States and Israel and the broad range of policy, charitable and intellectual pursuits in which they are engaged.